Is meRa peak on your bucket list? Mera Peak, Nepal’s highest trekking peak lies on the edge of the famous Khumbu Region, where it overlooks many of the world’s highest summits, including Mt Everest. Although Mera Peak is at a significant altitude, the climbing is not technical and relatively straightforward. This trip is ideal for those looking to venture into Himalayan Mountaineering, who have a good level of fitness and a keen sense of adventure. Ultimate Mera Peak Expedition is the highest of the designated trekking peaks in Nepal. Its altitude rises to 6,461m with amazing views of five of the world’s 8000-meter peaks: Mt. Everest, Kanchenjunga, Makalu, Lhotse and Cho Oyo from the summit. This makes Mera Peak a great challenge but one that’s more than achievable. Mera Peak lies in the Mahalangur section in the Makalu Barun National Park, situated in the Solukhumbu district of Nepal. There are three main summits of Mera Peak: north (6,476m), central (6,461m) and south (6,065m). Col. Jimmy Roberts and Sen Tenzing were the first people to ascend the Mera Central on 20th May 1953. Trekkers require special permits to enter the Makalu Barun National Park and to climb the peak. EverTrek takes care of this for you. The Ultimate Mera Peak expedition begins with an exciting 40-45 min flight to the mountain airstrip of Lukla (Labelled the most dangerous airport in the world). The trek winds it’s way through forests of rhododendron, pine and bamboo, taking a longer, less trodden trail that gradually passes through the beautiful landscape of the Hinku Valley up to Mera Peak. You will fall in love with the most incredible mountain views, sample the local Sherpa culture and lifestyle and get to experience a real Himalayan expedition. Climbing Mear Peak is physically demanding due to its altitude, but not technically difficult. We plan these trips at times of the year where the you will have the best chance of summiting the peak. Spring (March-May) and Autumn (September-November) are the best times to climb the Mera Peak in terms of weather, visibility and the trails. Already booked on this holiday? Or looking to book on one of our departures in 2018 or 2019? 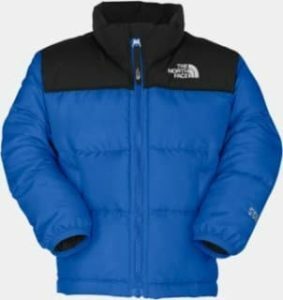 ALL customers can opt to use free hire of a sleeping bag, duffel bag and down jacket worth £110 – when reserved before your departure date. 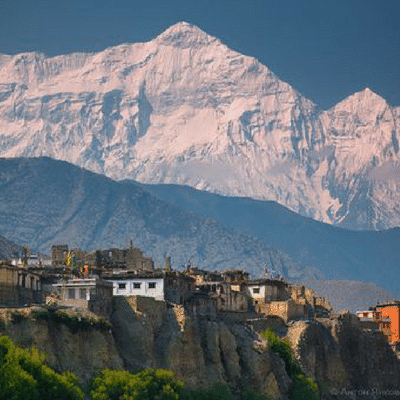 Climb a Himalayan Peak reaching an altitude of over 6000m with spine-tingling views. Our Team in Nepal have been guiding to Mera Peak since 2001. 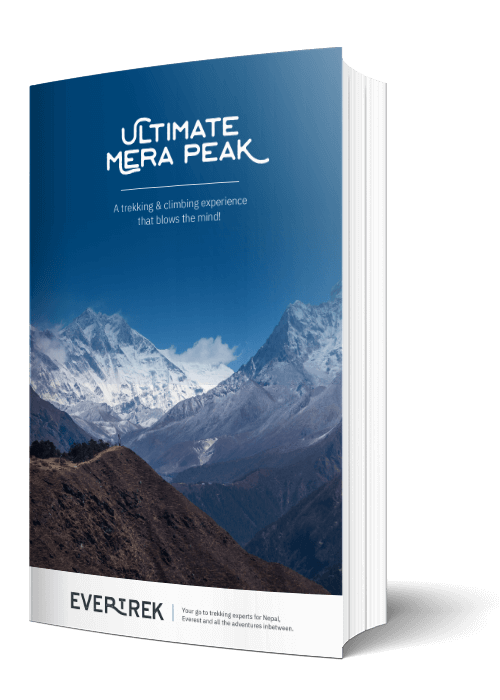 The Ultimate Mera Peak Expedition is a tough and arduous trek and climb. It is meant to be challenging. You must be a fit, regular hillwalker to take part, used to long, consecutive days walking in the British Mountains, preferably in Winter. You should have experience of walking steep, boulder-strewn paths where the use of hands has been essential to scramble upwards over rocky steps. Previous experience of Himalayan trekking is preferable, but not essential as long as you are a very regular and committed hill-walker. As this route takes you over remote high passes and a Himalayan peak, experience of having been to 5000-metres before is ideal. 3 nights accommodation in the excellent Apsara Boutique Hotel in Kathmandu with breakfast. Welcome to Nepal. Today is your first day with EverTrek. We will pick you up at the Tribhuvan International Airport in Kathmandu and transfer you to the hotel in Thamel. We will also catchup with the rest of the group before we meet in the evening for our welcome dinner at one of the finest, local Nepali restaurants in Kathmandu. Time for some local dance and some amazing Nepali food. Today we will head out into Kathmandu and visit the cultural and historical sites of the Kathmandu valley. We will visit the UNESCO World Heritage Sites in Kathmandu and have lunch at one of our fasvorite viewpoints in the city. Kathmandu lies at 1300m above sea level so it’s important to get out and about today and let your body acclimatise. In the evening we will grab any last minute items in the trekking hub of Thamel and get an early night ready for the trek tomorrow. We will grab an early flight to Lukla airport. It all starts here! The flight to Lukla is one of our favourite parts of the trek. Landing at the Tenzing-Hillary Airport at Lukla is on many peoples Bucket List upon landing we will meet the remaining crew members, who will be assisting us throughout the trek. We will descend down towards Surke through the jungle. The trail then continues through traditional mountain villages before reaching Paiya where we will spend the night. Overnight in a tented camp at Paiya. Pangkoma is the destination set for the day. After a hearty breakfast we will depart Paiya and walk down to the wooden bridge and trail leading up to Kari La Pass. After crossing the pass, the narrow mountain trail leads us to the beautiful village of Pangkoma. The night will be spent at a lodge in Pangkoma. Nigmsa is the destination set for the day. After breakfast we will follow the rocky path that first leads us through the rhododendron forest and continues through the hills and mountain ridges. Here we can enjoy the views of the south face of Mera Peak. We then walk down to the village for lunch and continue on a zigzag route trail through the pine forest and descend to get to our destination for the day, Nigmsa. The night will be spent in a tented camp at Nigmsa. Chetrakhola is the destination for the day. After leaving the village of Nigmsa, the trail starts to get steep and narrow. As we cross the local stream and walk through the rhododendron forest we might get a chance to see some local wildlife. We will eventually get to our destination for the day, Chetrakhola. The night will be spent in a tented camp at Chetrakhola. Kothe is the destination for the day. We get up nice and early and head for the village of Kothe. First we reach the awesome viewpoint of the Hinku Valley. Take in the views and the mountains around. The trail is still narrow and we navigate through the local forest once more. Once again you may spot some local wildflie including the sloth bear and jungle cat. We will eventually reach the village of Kothe. The night will be spent at a lodge in Kothe. Tangnag is the destination for the day. This is a superb place to enjoy the views of the beautiful Mera North. Tangnag is a summer village with primitive lodges and just a few tea houses and is only 3-4 hours away from Kothe. Leaving Kothe, the route ascends gradually along the ridge of the Hinku River. We stop for lunch at Gondishung and then pay a visit to a 200 year-old Lungsumgba Gompa, which is on the way to Tangnang. We spend some time exploring the monastery. A short walk from the monastery will take us to Tangnag. The night will be spent at a lodge in Tangnag. We will spend today acclimatising as we are reaching some serious altitude. 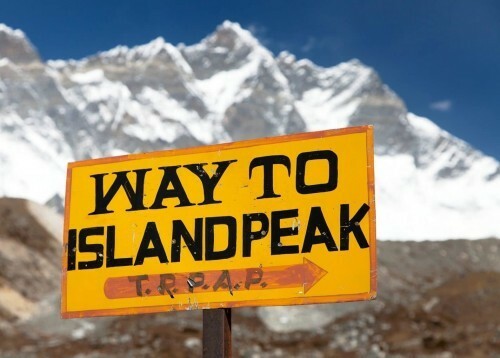 We will hike up to the Charpate Himal Glacier which should take us around three hours or so. Upon reaching the top you will see the views of the Mera North Peak and glacier. After spending some time here letting our bodies adjust we will descend back to the camp site at Tangnag. The night will be spent in a tented camp at Tangnag. Khare is the destination set for the day. We now head east towards Khare and follow the glacial moraine of the Dig Glacier to a pasture called Dig Kharka. This rugged and challenging trail leads us to the Shar Glacier. From here the route is steep but we will press on until we reach the campsite at Khare. The views here are immense and what a place to spend the night. The night will be spent in a tented camp at Khare. Mera Base Camp is the destination of the day. Today leaving Khare, we head towards the Mera Glacier up to the Mera La Pass. Its an exciting climb and the superb views from the pass are simply breakthtaking. We make a short ascent to set up our camp. We also have time to get some rope and winter skills practice which our climbing guide will go through with you. We will spend the rest of the time relaxing and preparing the muscles for the next day’s walk. The night will be spent in a tented camp at the Mera Peak Base Camp. We are so close. The summit is not far away at all. Today we will head to the High Camp of Mera Peak. Departing base camp we continue our ascent of the north face of Mera peak to a spectacular porch nestled just below the cairn where we will set up our high camp. The trail is rock-strewn for about two hours before we reach our destination. After camp is set up we will relax and save our energy for the big day tomorrow. The ascent of Mera Peak. The night will be spent in a tented camp at the high camp. Summit day! We normally start our ascent at around 2:30 am where we will get our equipment ready and our crampons on. After about a 4-5 hour journey and with tired legs you will reach the summit of Mera Peak. You did it! 6000m peak ticked off the Bucket List. We take some photos and enjoy the moment before we descend back to high camp for lunch and then continue down till Khare. Overnight in a tented camp at Khare. Weather in the Himalayas can be a challenge. Sometimes, due to unfavourable weather conditions, we might not be able to summit Mera Peak so today is a contingency day. If everything goes well, this day can be cut off from the itinerary. Kothe is the destination for the day. We retrace our footsteps back to the village of Kothe. Once again we get a chance to enjoy the views of the valley, the glaciers, the rocky paths and the summer settlement before reaching Kothe. Time for a celebration tonight as we try the local beer and enjoy the summit success. Overnight at a lodge in Kothe. Thuli Kharka is the destination for the day. We leave the harsh rock terrain and make our way towards Thuli Kharka. You can almost taste the extra oxygen in the air as we reach this lush landscape. We once again follow the Hinku River ridge trekking down towards Tashing Ongma and then leaving the river ridge walk up towards the Thuli Kharka. We are greeted with a grand view of Mera peak at this place. Overnight at Thuli Kharka. Lukla is the destination for the day. We hike for about 2 hours upwards fromThuli Kharka to Zatrwa La Pass. As we traverse the pass, leaving the Makalu Barun National Park behind, we are welcomed with a grand view of the Lukla Valley. This is an easy, straightforward walk which will take us to the village of Lukla. The night will be spent at a lodge in Lukla. We finally leave the mountains after an amazing life changing trip to Mera Peak. We will depart Lukla and fly back to Kathmandu early morning. After arriving back to the hotel in Thamel we will relax and take a massage and enjoy some well earned beer. In the evening we will head out for our final dinner at one of our favourite restaurants in Kathmandu. 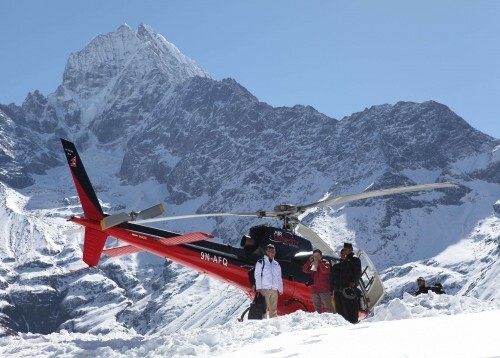 Today is the last day of your trip in Nepal with EverTrek. What a journey its been! We will transfer you to Kathmandu airport and bid you a farewell and a high five on a job well done.